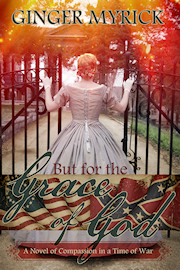 Set during the American Civil War, BUT FOR THE GRACE OF GOD combines a sweet old-fashioned love story with a compassionate look at the people affected by the struggle for equality. Hannah Carter never expected to find love, especially during a time of war. By the spring of 1864, the conflict between North and South has raged on for years and still shows no sign of resolution. On her small farm in West Virginia, the young widow and her household have managed to remain untouched until a mysterious green-eyed soldier shows up, wounded and in desperate need of medical attention. Never able to turn away someone in need, Hannah risks everything to take in the stranger and tend to his injuries. Beau develops tender feelings toward Hannah, and she is equally smitten, but circumstances conspire to hinder their happiness. Beau is a Confederate soldier wanted for the murder of one of his own, and Hannah’s farm is a rest stop for fugitive slaves en route to freedom in the North. Will justice catch up with Beau and force him to pay for his crimes? Will he discover Hannah’s secret humanitarian efforts and betray her to the authorities? Or will they find a way to overcome their differences—to make peace, to live, and to love?